A stylized interpretation of vein cut stone. TidesHDP is a stylized interpretation of vein cut stone. Specifically a linear cut Travertine or Limestone known as “Georgette”. This look in its natural form is a stunning linear play of tone on tone colors that create this contemporary look. 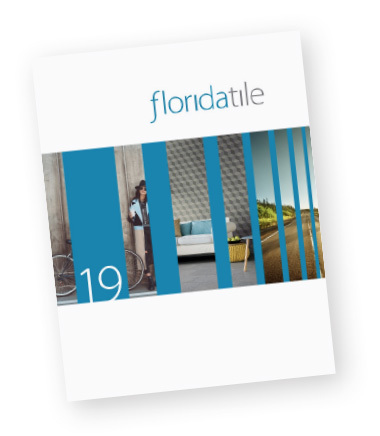 Using Florida Tile’s HDP-High Definition Porcelain® technology however, we not only reproduce this stone look, but we are able to let our imaginations go wild with bold color combinations that can't be found in nature. From bold blue’s to steel gray and dark brown, we created contemporary colors that can be specified in any commercial space. Each color has a unique blend of complimentary colors within its veining to add interest and depth, as well as pair beautifully with other design finishes. This glazed porcelain floor and wall is available in pressed 12x24 with a 3x24 bullnose for each color. We have also added a unique patterned 25 piece mosaic that rotates each chip 90 degrees, to create a wonderful checkerboard pattern.